In the early 1880’s, a local music dealer began a Sunday School class on the second floor of a shop building in the 800 block of North Mangum St in Durham. Once A.E. Whitaker moved away, others picked up the work until the membership outgrew their space. Under Rueben Hibberd, C.M. Lance and E.M. Hoyle in 1902, a lot was developed at the intersection of Cleveland and Mangum Streets into a suitable sanctuary. A membership roll of 100 was reached in 1909. 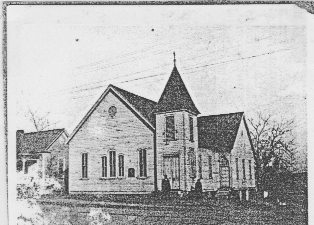 Originally called Magnum Street Methodist Episcopal Church, what we now know as Calvary began in 1916 once again as the original congregation outgrew their sanctuary. The congregation erected a new church at the corner of Trinity Avenue and Elizabeth Street. Original donations toward the sanctuary topped just over $3000 for the build. Their first worship service was on December 3. 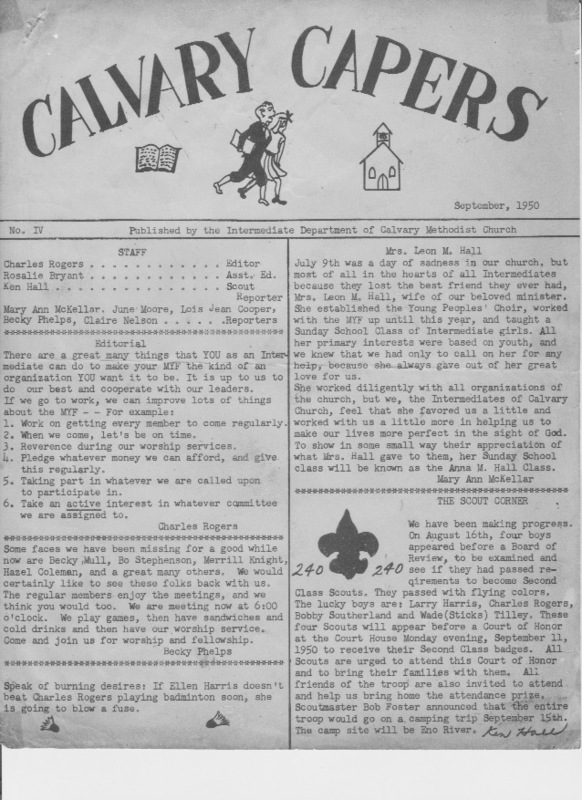 Middle School Youth Group (MYF) Newsletter from Fall 1950. The congregation increased the salary of D.E. Earnhardt from $1,000 to $3,000 during his tenure from 1922-26. In the 1930’s, a log cabin was built to accommodate the Sunday School classes and later expanded in the 1940’s. Also, land for a parsonage was purchased, adjacent to the property on Elizabeth Street for $7500 . 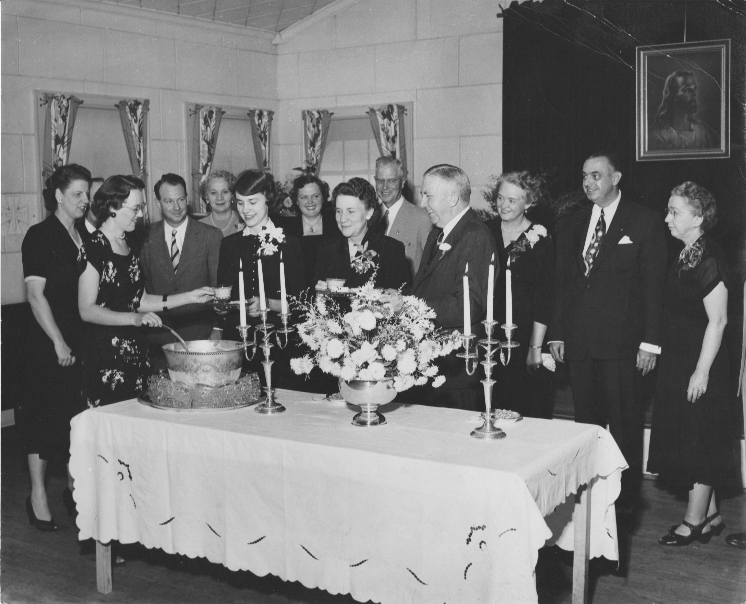 In 1955, a fundraiser began to raise the $167,000 to build a new Educational Building, just behind the sanctuary. This project was completed in 1964. The current parking lot on Elizabeth Street was purchased in 1959, then known as the Nannie Mangum property. Once the Methodist Church and the Evangelical United Brethren Church denominations merged in 1968, the official name of the church became Calvary United Methodist Church. The church sanctuary became air conditioned in 1969. Led by Rev. Laurie Hays Coffman, Calvary voted to become a Reconciling Congregation in 2002. This was the first instance that any church in the Carolinas had decided to make a stand for inclusivity and acceptance of LGBTQ persons, becoming a spiritual and cultural pioneering congregation. Find out more info on Reconciling Ministries here. Today, Calvary is home to multiple non-profits and faith communities that operate out of the Educational Building, working together to serve Durham and beyond through their mission and worship.